As I looked out the window this morning all I saw was gray. 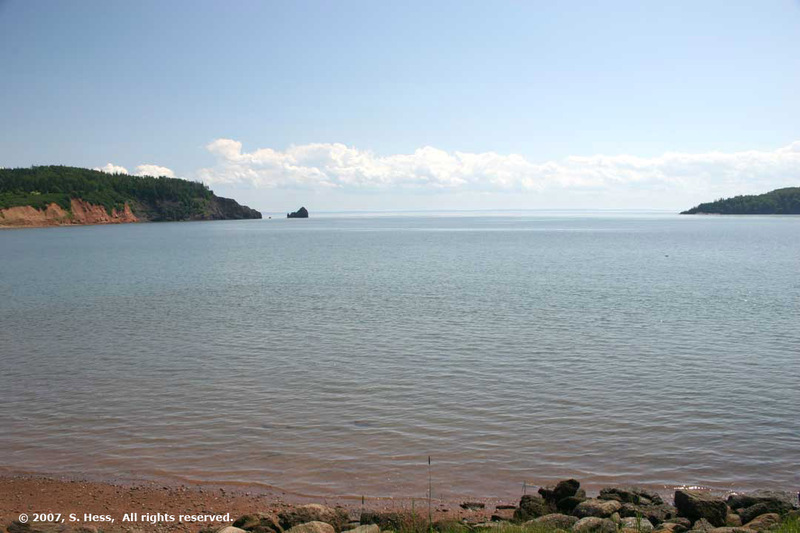 It was cloudy and a haze covered the far shore of Minas Basin. Fourtunately, it was just a teaser. 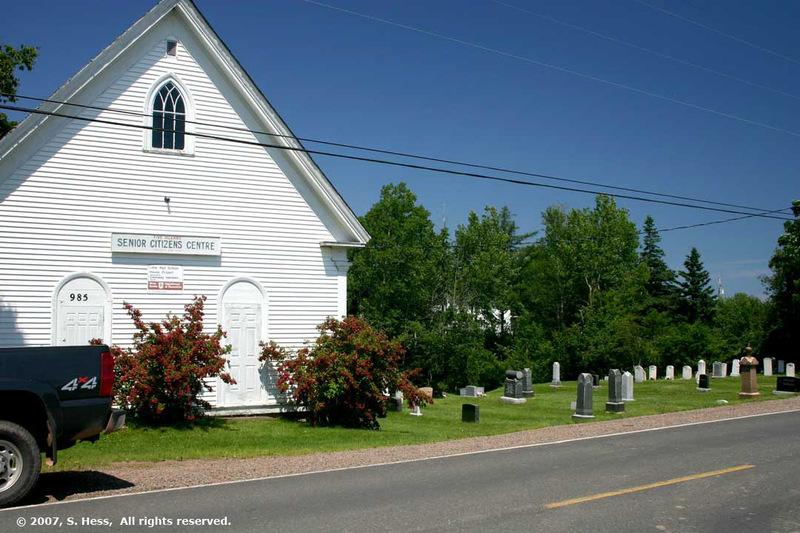 We left the campground heading for Maitland, which the guidebooks said was an interesting town. Beside some nice old buildings in the center of the town, we didn't see anything of interest. On the way in and out of Maitland you have to cross the Shubenacadie River which has a pretty good tidal bore. A tidal bore is created when the incoming tide overwhelms the flow of the river and creates a standing wave. 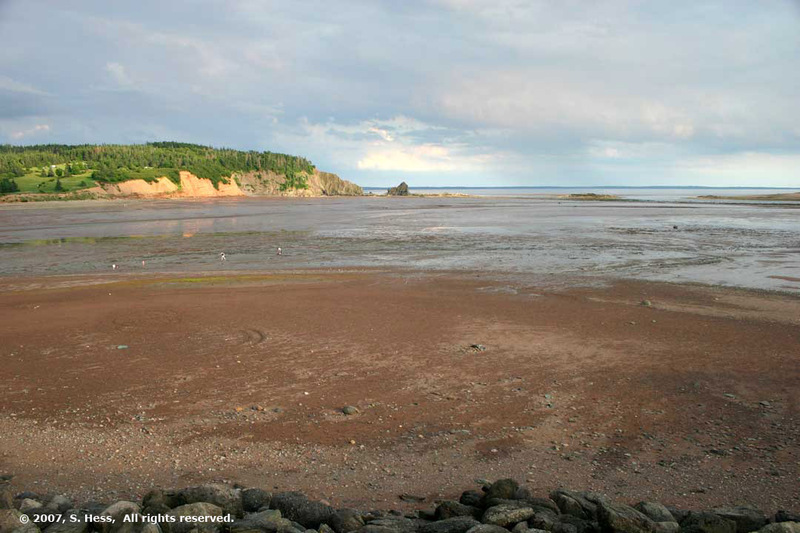 There are a number of tidal bores in the Bay of Fundy area. What was fascinating to us was that there were a lot of tourists standing on the remnants of an old bridge looking at the river. 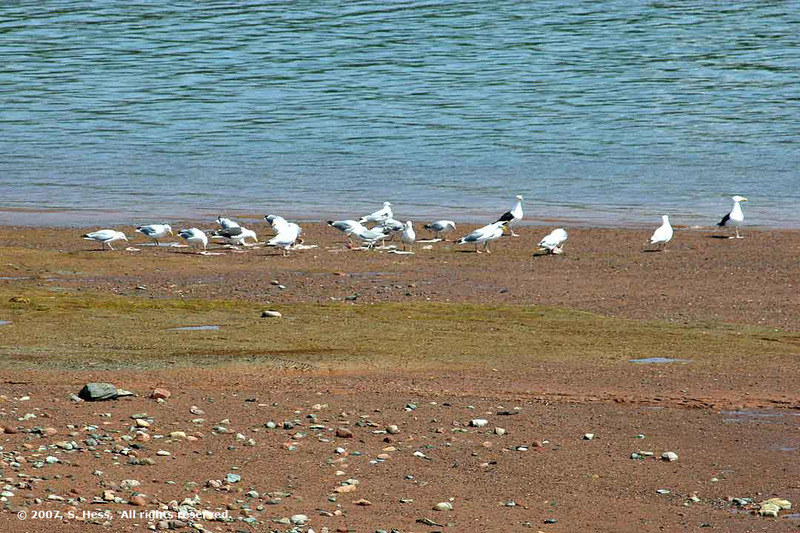 It was low tide and the only thing they saw were the tidal flats with a river running through them. I guess they were going to take pictures and title them, "this is where the tidal bore would have been had we been here at the right time." 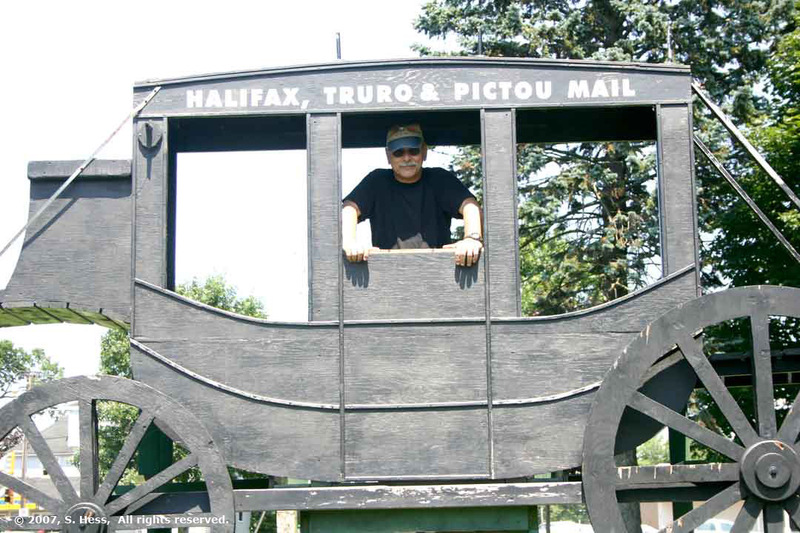 We headed into Truro. One of the reasons we wanted to go in is to get access to the Internet. We went into the Visitor Center and found out that they had WiFi and we were in heaven. It has been a couple of days of being unable to reliably communicate. The campground doesn't really have any Intenet access (the owner offered to let me use his dial up) and cell phone service was erratic, at best. We used the opportunity to upload the pages for the past two days, catch up on e-mail and pay some bills. We had driven through Truro a few days ago and noticed tree trunk sculptures all over. Unfortunately, most of the sculptures we saw were located in places where it was not easy to park to get a picture. One of these sculptures was outside of the Visitor Center and another was down the block (see pictures below). 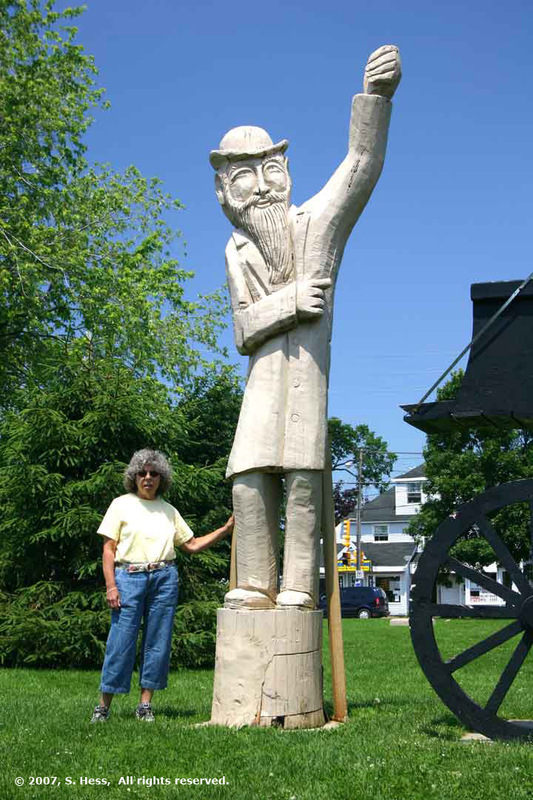 One of the attendants at the Center told Susie that these sculptures are the result of Dutch Elm Disease destroying many of the town's trees. 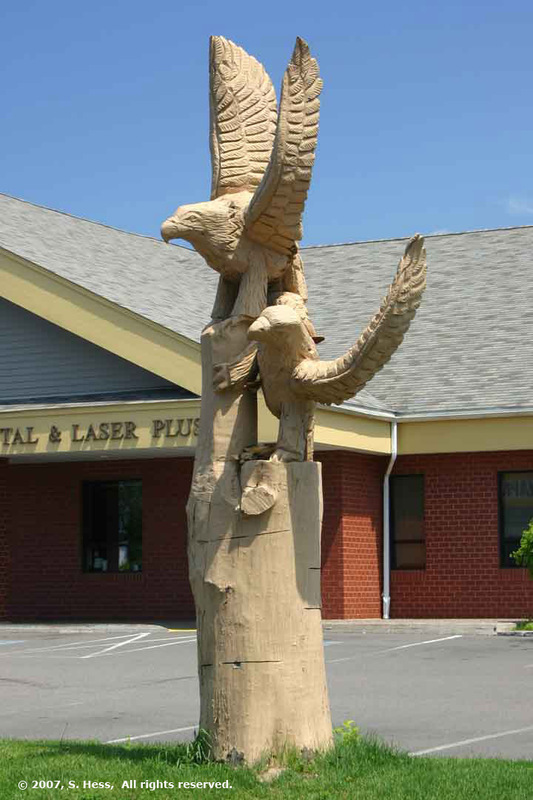 In 1999, the Tree Committee began a project that would replace the dead trees with tree trunk sculptures. 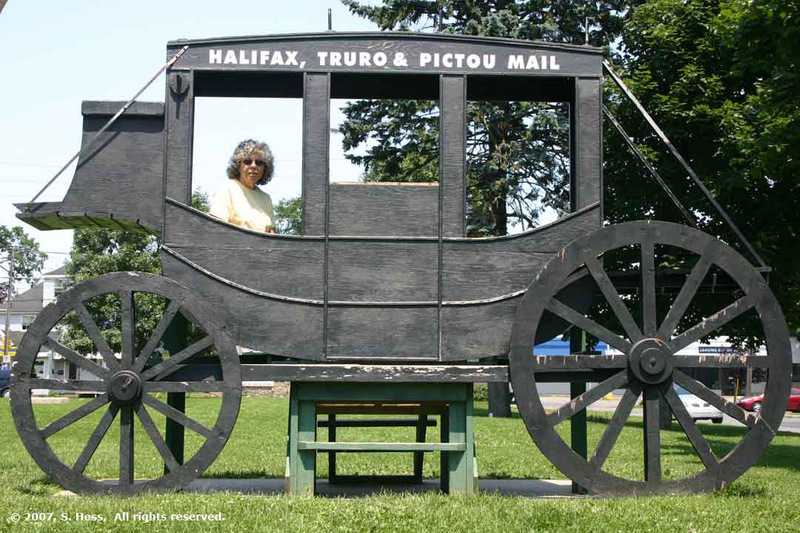 The overall theme of the sculptures is to celebrate the heritage of Truro. Many of the sculptures are of individuals who played a role in the development of this heritage. We returned to the campground in time to catch the outgoing high tide. we had not see a high tide since we have been in Lower Five Islands because it was at night and we were asleep or we were out exploring the area. By the time we arrived back, the tide was already on its way out. Judging by the wetness of the rocks behind our trailer, I would say that the tide was already down at least three feet. The tide differences in this area are as much as 55 feet at Lunar High Tide. Even though we missed high tide, what we saw is quite impressive when you compare it to low tide (see below). We were sitting behind the trailer overlooking the water as the tide was going out when I noticed a carcass of a large fish was washed up on the flats. The gulls spotted it and soon there were twenty or more fighting over the scraps. We were surprised when a bald eagle swooped down grabbed a piece of the fish in his talon and took it directly in front of us (about 75 feet away) and started eating. 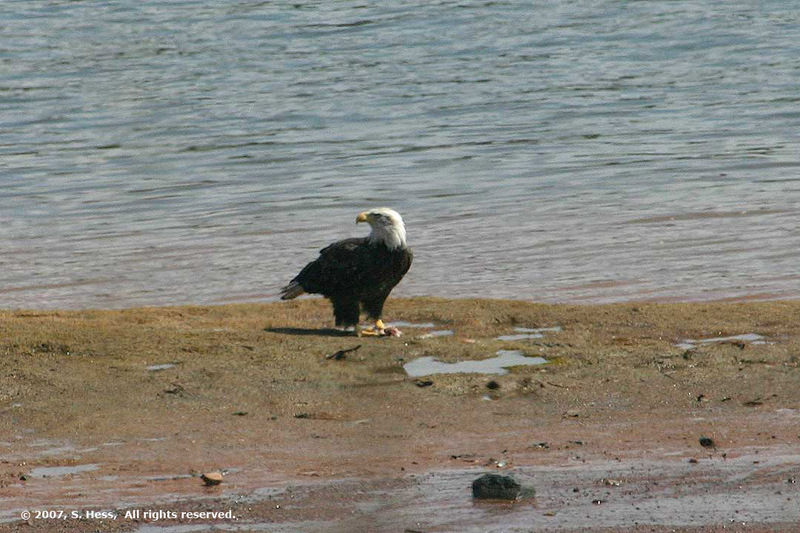 A little while later a juvenile bald eagle (it did not have the white head feathers) arrived and they both flew away. 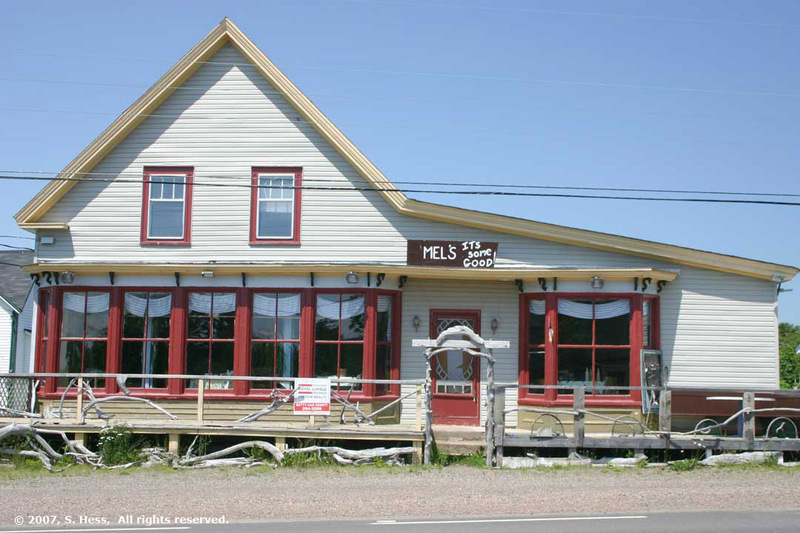 This was not a sight we expected to see in Nova Scotia. This restaurant was about 1.5 miles from the campground. What caught out attention was the sign saying, "It's some good." It must not have been too good because the other sign says it is for sale. A few hundred yards from Mel's was the Senior Citizen Center. You have to question the wisdom of placing it next to a cemetery. It certainly doesn't seem to send a positive message about the seniors' future. High and low tides viewed from behind our trailer. The rocks in the background are sitting completely out of the water at low tide and boats were passing over them at high tide. The rocks in the foreground are below the water at high tide.